Marine Le Pen, the leader of France’s far-right Front National Party, will appear in court for inciting racial hatred. The charges stem from remarks she made during a 2010 rally in Lyon. At the rally, Le Pen made disparaging comments about the Muslim population of France, comparing public prayer to the Nazi occupation. Le Pen’s 2010 remarks came while she was campaigning to become the president of the Front National, a position she effectively took from her infamously anti-Semitic father, Jean-Marie Le Pen. Marine Le Pen has been credited with making the Front National more appealing to mainstream French voters and is likely to win a regional election later this month. Her critics, however, argue that she’s simply switched out the party’s notorious antisemitism with Islamophobia. Both trials and convictions for inciting “racial hate” (Le Pen’s officially charged with “incitement to discrimination over people’s religious beliefs”) run in the family. Her father racked up 18 convictions—largely for Holocaust denial— during his tenure as president of the Front National. For her part, Le Pen seems to welcome the trial: “Of course, I’m not going to miss such an occasion,” she told Agence France-Presse. On Twitter she expressed indignation over the court hearing: “It is easier to prosecute those who denounce the illegal behavior of fundamentalist...than to prosecute the fundamentalism behaving illegally,” she wrote. 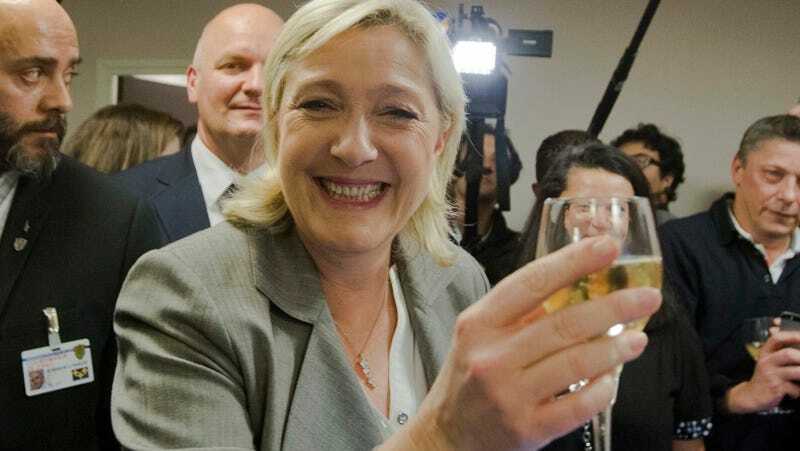 If convicted, Le Pen could face up to a year in prison and a $70,000 fine.